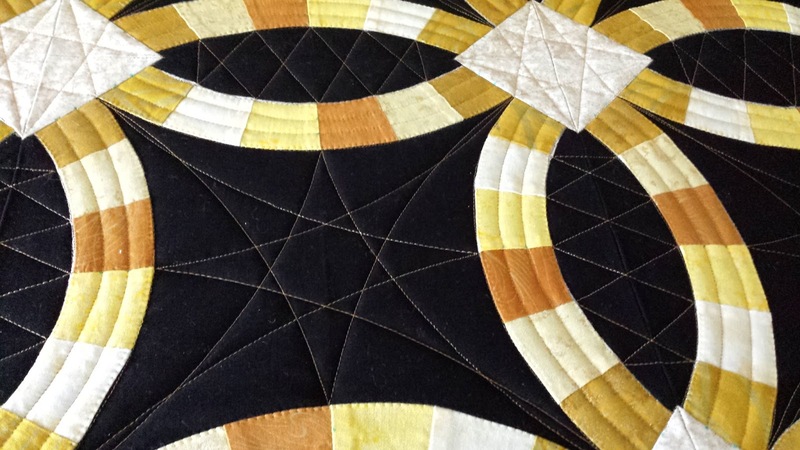 I recently had the honor of being part of the journey of Kevin's Double Wedding Ring Quilt. To see the beginning and ending of it's journey, visit Kevin's blog (# 1 on my Favorite Blog list). My part of the journey was the quilting. Not a traditional Double Wedding Ring, therefore, I felt it needed non-traditional quilting. No Feathers! I know... if you know me or have seen my work, I LOVE feathers. To quilt an entire quilt with no feathers is a challenge for me. One I was looking forward to. After lots of contemplation, designing, erasing, and drawing (yes Kevin, I drew on your quilt! with chalk), I finally decided on the quilting path to take. Please visit Kevin's blog (#1 on my Favorite blogs list) to see the rest of this quilt's amazing journey! You mean you drew on my quilt????? LOL It turned out beyond amazing, as your work usually does! Thanks for being a part of the quilt's journey! Mom and Dad LOVE it!